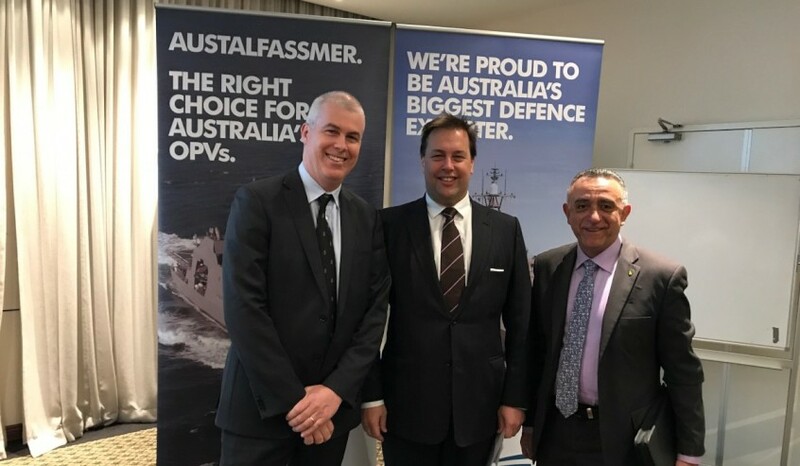 From left; Austal Market Development Manager and OPV Capture Manager Mr Tim Speer with Member for Mackellar, Jason Falinski MP and AIDN NSW President Mr Medhat Wassef at the AustalFassmer OPV Industry Engagement Forum in Sydney, 24 July 2017. Industry roadshows presented by the three Offshore Patrol Vessel tenderers have been taking the country by storm since last year, and one contender has told Defence Connect the interest from the industry is growing by the day. As Austal and its teaming partner Fassmer prepares for the next industry engagement forum in Geelong this week, chief executive David Singleton told Defence Connect there have been encouraging signs as the program has progressed from its initial start back in October last year. "It's been extremely positive," Singleton began. "We've been involved in the supply chain in Australia for 30 years so we have a very good insight on the supply chain, but even for us it's helped us to identify new suppliers who are keen to get into military type activity." And the benefits of the engagement forums are not just for Austal and their bidding partner Fassmer, with Singleton adding that the forums have given local suppliers the opportunity to engage with the two Defence primes. "I think almost more importantly, it's allowed local suppliers, who don't have the reach to be able to travel across Australia easily and talk to people like us, it's given them the ability to talk directly to Fassmer and talk directly to Austal about what the opportunities are, and small companies need that kind of help," Singleton explained. And it seems that this is not lost on the SMEs across Australia, with Singleton acknowledging Austal has been pleasantly surprised by the interest all across the nation. "I think actually what surprised me is just how much interest there has been everywhere we have gone. Certainly Cairns, in northern Queensland, was a very interesting area because they used to, and in fact they are alive to the need for maritime support, because a lot of the maritime, a lot of the Navy and Border Force vessels visit up there; it's a significant part of their economy, so that was very strong," said Singleton. "I guess what surprised me was how much interest there was in New South Wales and Victoria as well, in places that perhaps we didn't think there would be so much interest and there's much broader interest than we have anticipated." AustalFassmer are competing against Damen and Lürssen, both of which have partnered with ASC shipbuilding for their bids for the $3 billion OPV project. Construction of the vessels is due to start in 2018, with the government anticipating two will be built in South Australia, and 10 will be constructed in Western Australia.